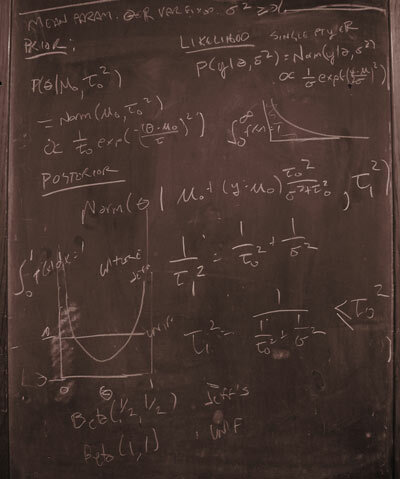 Mark Johnson’s comment in my last post about a Bayesian proposal for identifying known unknowns, sent Mitzi and me to the chalkboard after dinner (yes, we’re nerdy enough to have a chalkboard in our breakfast nook) to see if at least estimating normal means works the same way. Yes, it does. Posterior variance is always lower than prior variance about the mean parameter. Of course it is, since the precisions (inverse variances) are non-negative and additive. I’ve read all of this many times, but it takes a real example to make things stick. This now has the right properties. The highest possible posterior entropy here is with all probability mass centered at 0.5, leading to an entropy of 1. Even if the posterior for is tighter, if it’s shifted more centrally, it’ll result in increased entropy. The lowest possible entropy will result with all of the probability mass centered at either 0 or 1, leading (in the limit of a delta function [cool animation on Wikipedia]) to an entropy of 0. PS: Sitmo.com is a very sweet little app for adding LaTeX-derived images to blogs, which is especially easy with their permanent links (I don’t quite trust that) and WordPress’s image insertion button. It reminds me of a Mac app I used in the 90s that tried to render LaTeX WYSIWYG. But it’s still a major pain compared to the joys of directly using LaTeX or even of just rendering something that looks ugly in HTML. This entry was posted on December 5, 2008 at 3:04 pm and is filed under Carp's Blog. You can follow any responses to this entry through the RSS 2.0 feed. You can leave a response, or trackback from your own site.